Talking math with your kids takes two forms: (1) seizing opportunities the kids initiate, and (2) creating opportunities where there might previously have been none. This is story of creating an opportunity—first with my four-year old, then with my seven-year old. Tabitha: (4 years old) Where are the scissors? This conversation was about groups and units. If kids are going to understand place value, they’ll need to be able to think about different units. Sometimes a unit is a thing (an eye); sometimes a unit is a group (a pair of eyes). We counted both. When Griffin finds two sevens instead of seven twos, he using the commutative property of multiplication. Sometimes called the rearrangement property, it is a fancy way of saying that when you multiply, it doesn’t matter which number comes first. 7×2=2×7. Following up on Griffin’s strategy requires more math knowledge than many parents are comfortable with. That’s OK. That’s why Talking Math with Your Kids is here. Shoot us a note with your questions. But if you are comfortable with the idea (and/or the vocabulary) of commutative, you could follow up with Does this always work? or a discussion of what things in the world are commutative and what things are not. Real-world example? In the bathroom (forgive me), Wipe, Flush, Wash is not commutative. Do those in a different order and get different results. But Use the potty, Brush your teeth, Put on your pajamas? Totally commutative; the order we do them in does not matter. Give kids practice counting both groups and individual things. Just help them notice that some things usually do come in groups. Eggs, bicycle wheels, grapes; these are all things that usually come in groups. Ask whether the groups are always (or almost always) the same size. 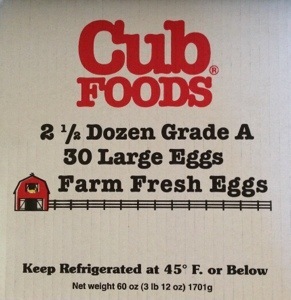 Notice with your children that your grocery store (probably) has this package of eggs, and wonder aloud how many eggs are in two-and-a-half dozen. Correcting Tabitha when she added 7 and 2 to get 9? That wasn’t nearly so important. She was four at the time; multiplication facts typically become important around eight or nine years old. 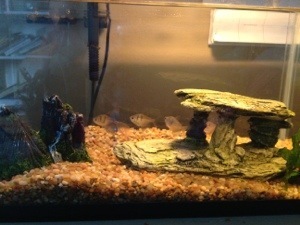 This entry was posted in Number and tagged Griffin, pairs, Tabitha, unit. Bookmark the permalink. Lovely piece, Chris, as always. The last sentence is likely invaluable to those parents and teachers who are willing and able to read and heed it. The insane “rush to (mis)understanding that surrounds elementary arithmetic concepts and operations in this country is one source for the plague-like fear and loathing of mathematics that continues to run rampant in adults and children alike. The obsession with individual and collective measuring, comparing, and competing that drives us to inappropriately try to get ever-younger children to race to nowhere has long been a great source of misery in the United States and will continue to be one as long as we think that learning is a zero-sum game. I love when math comes up in everyday conversations. For us, most of our math is done at the dinner table (though we refrain from counting fish eyes while eating). Math is so applicable when it comes to food. Right on, Nilesh! Your interpretation is quite possibly the correct one! I ought to have asked. So many opportunities!